It’s unhealthy to get stuck in the past. 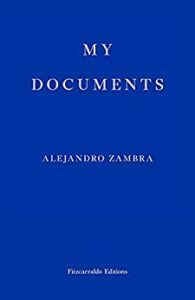 My Documents is a collection of short stories by Alejandro Zambra, the award-winning Chilean writer, that are constantly playing with the idea of memory, truth and fiction. Whereas the recently released Not to Read is a collection of his non-fiction writings that can be loosely termed to be a literary autobiography while sharing his theory of reading. Like the many who have written before him, he too is of the opinion that reading and reading is what matters the most. There is a lovely anecdote he recounts of being able to read to his heart’s content when he was unemployed and seeking a job. He would spend the morning distributing his resume but would hurry home by late morning, so that he could then have an entire day to himself to read at leisure. Later when he did get a job he was fortunate enough to be appointed a telephone operator at an insurance company which meant he worked nights and there were hardly any calls to attend to. Once more giving him ample time to read. The joy of uninterrupted time, solitude and silence — the perfect mix to allow one to sink into the book. My Documents, published in 2015, consists of short stories. A short story collection can become predictable and monotonous in tenor but this is certainly not true of My Documents where each story is unexpected. It is not just in tenor but also in the form. It is impossible to tell whether it was like this in the original language too but in the hands of an incredible translator like Megan McDowell, there is a gritty texture that comes through each story. It is also difficult to discern what is fiction and what is a memory being shared of living in Pinochet’s era. The reader who is unfamiliar with the local cultural landscape is immediately immersed into it, it is like being transported to Chile in real time and witnessing the action. The stories, the people, the peculiarities, the conversations etc. Alejandro Zambra achieves this without any longwinded descriptions. My favourite story is “I Smoked Very Well”, a meditation on trying to give up the habit of being a smoker but at the same time in his characteristic style meanders into the literary space, making excuses that his inability to get off his nicotine habit is also the root cause of his writer’s block! Not to Read is a collection of short essays previously published in the newspaper. So these are really short reads of about 2-5 mins. And yet so opinionated and loads of fun to read. He creates a literary landscape that is so incredibly detailed if all the 60-odd essays are read together, it makes you yearn to have a library handy of all the books and authors Zamba mentions! It’s also rare to find an essayist like this nowadays who is so immersed in his work that that is all he wishes to talk about. He is not distracted by anything else. His writing style is simple and lucid and yet within it are embedded vast banks of knowledge and strong opinions. Take for instance his essay “In praise of the photocopy” where he talks about these “fake books” as he defines them, the photocopies he and his friends used to access literature. Essays by Roland Barthes marked with fluorescent highlighters; poems by Carlos de Rokha or Enrique Lihn stapled together; ringbound or precariously fastened novels by Witold Gombrowicz or Clarice Lispector: it’s good to remember that we learned to read with these photocopies, which we waited for impatiently, smoking, on the other side of the copy-shop window. As citizens of a country where books are ridiculously expensive to buy and libraries are poorly equipped or non-existent, we got used to reading photocopies, and we even came to find it charming. In exchange for just a few pesos, some giant, tireless machines could bestow on us the literature we so desired. We read those warm bundles of paper and then stored them on shelves as if they were real books. Because that’s what they were to us: rare, beloved books. Important books. The discussion around digital books, incidentally, is at times overly elaborate: the defenders of conventional books appeal to romantic images of reading (to which I fully subscribe), and the electronic propagandist will insist on the comfort of carrying your library in your pocket, or the miracle of endlessly interlinking texts. But it’s not so much about habits as it is about costs. Can we really expect a student to spend twenty thousand pesos on a book? Isn’t it quite reasonable for them to just download it from the internet? … Editors, booksellers, distributors and authors unite occasionally to combat practices that ruin business, but books have become luxury items and absolutely nothing indicates that this will change. 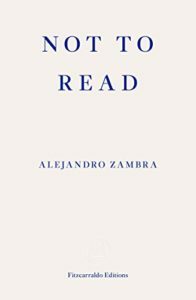 Alejandro Zamba’s last point is controversial since this is exactly what is at the core of the various legal battles in various book markets but he does make a strong argument. All his essays in the book are as simply written with a single idea shared pointedly. Whether you agree with his viewpoint or not is immaterial, reading the essays is pure joy. Two extracts from the book can be read at Harpers on “Literary Customs” and on the publisher Fitzcarraldo Editions website about “Obligatory Readings”. Ideally one should read both the books in quick succession then it is perfect. The two volumes of fiction and non-fiction writing compliment each other beautifully. If you have not as yet discovered the rising literary star of Chile, Alejandro Zamba, then you have a treat awaiting you thanks to the wonderful translations by Megan McDowell. Both the books mentioned are published by Fitzcarraldo Editions.